That message came across loud and clear in a new tally of Americans' views about the federal health insurance program for the poor. 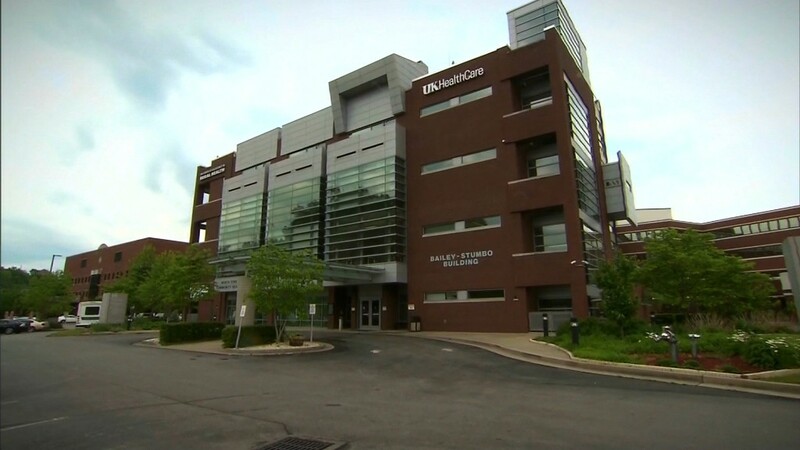 Across party lines Americans feel strongly the federal government should continue sending states extra funding to cover low-income adults under Obamacare's Medicaid expansion, according to a new Kaiser Family Foundation poll. The House GOP bill would end this enhanced match in 2020. About 11 million adults received coverage in the 31 states, plus Washington D.C., that expanded Medicaid. Some 71% of Republicans joined 93% of Democrats and 83% of Independents in saying it is important that expansion states continue to receive these funds. 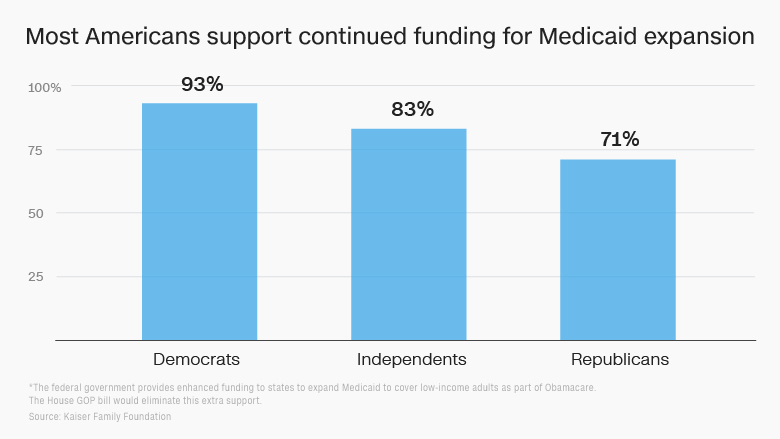 Americans also don't want Congress to mess with the overall Medicaid program, which covers more than 70 million low-income children, pregnant women, disabled and elderly people. Republican lawmakers hope to make major changes to Medicaid in their effort to repeal and replace Obamacare. The American Health Care Act would curtail federal support for the overall program by sending states a fixed amount of money, known as a block grant, or a set reimbursement level per enrollee, known as a per-capita cap. In exchange, states would get more flexibility and control over whom and what to cover. 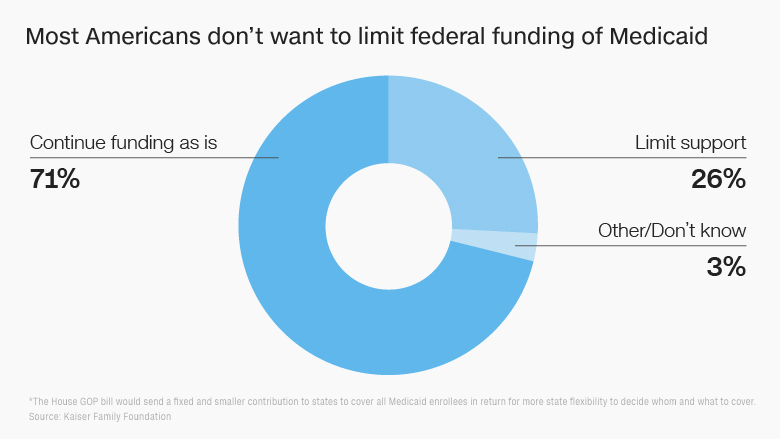 Some 71% of Americans want to keep Medicaid largely as it is today, while only 26% think federal support should be limited, according to Kaiser. Nearly six in 10 of those surveyed said that Medicaid is important to them and their families. This includes nearly 64% of Democrats, 57% of independents and 46% of Republicans. 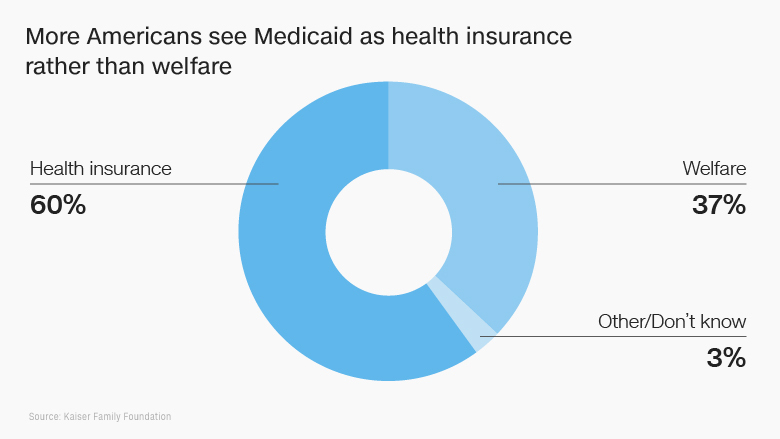 More Americans see Medicaid as health insurance, rather than welfare. Some 60% say it's more similar to other coverage programs, like Medicare, than safety net initiatives, such as food stamps. The American Health Care Act is now being discussed in the Senate, which has said it would overhaul the legislation. Medicaid's future remains a big sticking point.